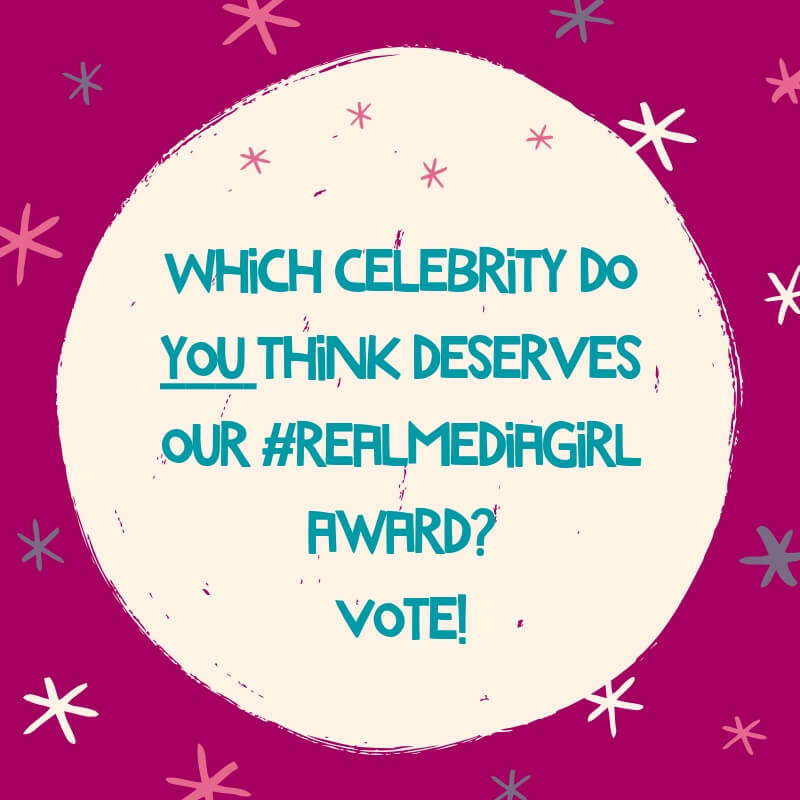 Vote Time: Which Celebrity Do YOU Think Deserves the #Realmediagirl Award? At MEDIAGIRLS, we’re all about using social media for good, in ways that make girls feel positive and strong. We define a #Realmediagirl as one who uses her social media to be authentic, speak up for what she believes in, and lift up other girls and women. More and more we’re seeing celebrities start to use their own platforms to do this, and we asked our Youth Advisory Board to weigh in on which female celebrity they think is most killin’ it. Here are their choices, and we want to hear what you think. Of these five amazing choices, who would you vote for? We’ll tabulate the results and announce the winner at the end of April on Insta @mediagirls. She is such an amazing, inspirational, emo queen that I feel like it’s about time that she finally gets recognized for being who she is. She is a great makeup artist and even embraces who she is without makeup. In one of her posts, she says, “I’ll always have days where I don’t like what I see, but tell yourself you’re important, beautiful and unique.” Even though I don’t like makeup, personally, I still find her to be just as inspiring. Evangeline DeMuro will always remain one of my favorite inspirations. Over the past year, this actress, model, and activist has given a voice to all women. She has spoken up against powerful people, despite potential consequences, to voice her opinion and to help women. Specifically, she stands up for women of all body types and promotes body positivity. She uses her wide platform to encourage women to speak up and use their voices. Who do you think deserves the 2019 #Realmediagirl Award? Alicia Keys’ music was basically all I listened to. I loved her songs and her style. She is very talented and beautiful, and I wish that I could grow up and be like her. She embraces herself and other people for who they are. Looking at her posts, she is so involved with supporting other people. She is a really cool lady. She is an outspoken feminist. She is very real and gives you the truth instead of being fake. She talks about the pressure of being in the media and she definitely deserves this award! I chose Alexandria Ocasio-Cortez because she uses her platform to raise awareness about important issues and fight for equality for minorities. All of her posts are focused on fighting for what’s right. She’s extremely inspiring and is also the youngest woman to ever serve in the United States Congress. Don’t forget – we’ll be announcing the results at the end of April so vote soon! And if you’re a teen girl interested in serving on our Youth Advisory Board starting in May, you can learn more and apply here. Then, next year, you’ll get to select a nominee. We’re looking for girls who are passionate about media and making it more positive and inspiring for girls everywhere! Sound like you? Get applying!